(Tokyo, March 12) Scientists at Tokyo Institute of Technology and Okayama University found a way of greatly improving the performance of LiCoO2 cathodes in Li-ion batteries by decorating them with BaTiO3 nanodots. Most importantly, they elucidated the mechanism behind the measured results, concluding that the BaTiO3 nanodots create a special interface through which Li ions can circulate easily, even at very high charge/discharge rates. It should be no surprise to anyone that batteries have enabled countless applications related to electric and electronic devices. Nowadays, modern advances in electrical devices and vehicles have created the need for even better batteries in terms of stability, rechargeability, and charging speeds. While Li-ion batteries (LIBs) have proven to be very useful, it is not possible to charge them quickly enough with high currents without running into problems such as sudden decreases in cyclability and output capacity owing to their intrinsic high resistance and unwanted side reactions. The negative effects of such unwanted reactions hinder LIBs using LiCoO2 (LCO) as a cathode material. One of them involves the dissolution of Co4+ ions into the electrolyte solution of the battery during charge/discharge cycles. Another effect is the formation of a solid electrolyte interface between the active material and the electrode in these batteries, which hinders the movement of Li ions and thus degrades performance. In a previous research, scientists reported that using materials with a high dielectric constant, such as BaTiO3 (BTO), enhanced the high-rate performance of LCO cathodes. However, the mechanism behind the observed improvements was unclear. 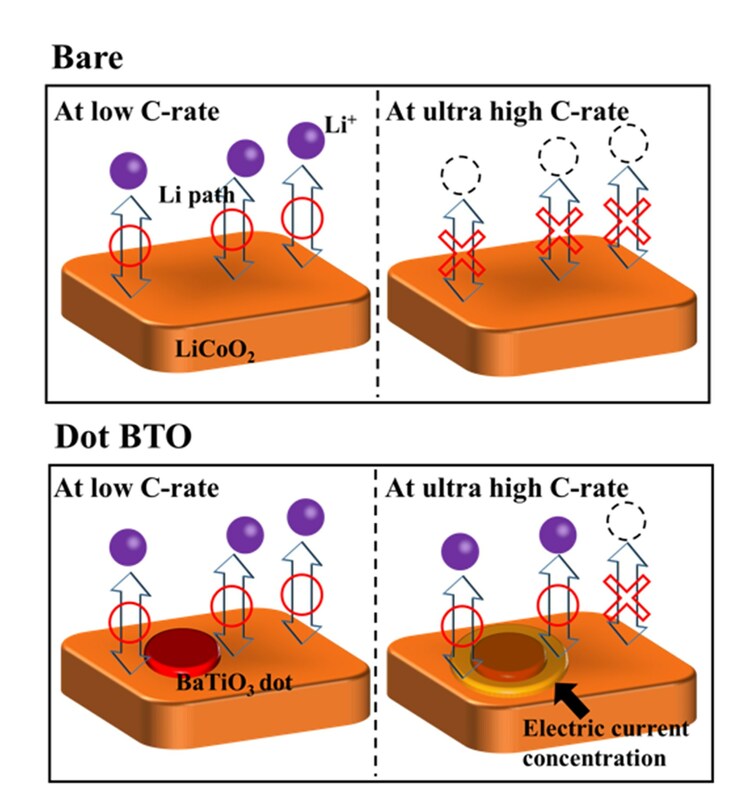 To shed light on this promising approach, a team of scientists from Tokyo Institute of Technology (Tokyo Tech), led by Prof. Mitsuru Itoh, Dr. Shintaro Yasui and Mr. Sou Yasuhara, studied LCO cathodes with BTO applied in different ways to find out what happened at the BTO–LCO interface in more detail. The team created three different LCO cathodes: a bare one, one coated with a layer of BTO, and one covered with BTO nanodots (Figure 1). The team also modeled an LCO cathode with a single BTO nanodot and predicted that, interestingly, the current density close to the edge of the BTO nanodot was very high. This particular area is called the triple phase interface (BTO–LCO–electrolyte), and its existence greatly enhanced the electrical performance of the cathode covered with microscopic BTO nanodots. As expected, after testing and comparing the three cathodes they prepared, the team found that the one with a layer of BTO dots exhibited a much better performance, both in terms of stability and discharge capacity. “Our results clearly demonstrate that decorating with BTO nanodots plays an important role in improving cyclability and reducing resistance,” states Itoh. Realizing that the BTO dots had a crucial effect on the motility of Li ions in the cathode, the team looked for an explanation. After examining their measurements results, the team concluded that BTO nanodots create paths through which Li ions can easily intercalate/de-intercalate, even at very high charge/discharge rates (Figure 2). This is so because the electric field concentrates around materials with a high dielectric constant. Moreover, the formation of a solid electrolyte interface is greatly suppressed near the triple phase interface, which would otherwise result in poor cyclability. “The mechanism by which the formation of a solid electrolyte interface is inhibited near the triple phase interface is still unclear,” remarks Itoh. While still much research on this topic needs to be done, the results obtained by the team are promising and might hint at a new way of greatly improving LIBs. This could be a significant step for meeting the demands of modern and future devices. Three cathodes were fabricated: a standard bare one (left), one coated with a layer of BaTiO3 (middle), and one coated with several BaTiO3 nanodots (right). The one with the nanodots exhibited greatly enhanced performance. The BaTiO3 nanodots concentrate electric current in a ring around them and create paths through which Li ions can pass, even at really high charge/discharge rates.